Kitesurfing lesson: third lesson and already on the board, well done Barry! 75 Euros the session, don't miss it! 90 Euros the private lesson! 40 Euros the Introduction to kitesurfing, you can't get cheaper than that! Come take your kitesurfing lesson and become enlightened! 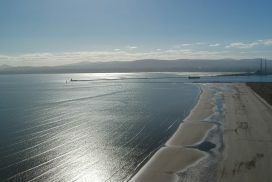 If you are new to kitesurfing, lets answer some questions you should have. Kitesurfing is a sport than use the pull of a powerful kite to make an individual (kitesurfer) ride a board over the water. If you can swim and are in normal physical shape, you can learn how to kitesurf. You don’t have to be strong, you will hold the power of the kite with your bodyweight through a harness. Kitesurfing doesn’t have to be an extreme sport, it is possible and amazing to just cruise. Let's answer some questions you must have about the kitesurfing lessons. Its 75 euros the session, 90 euros if its private lesson. The first session is half on the beach, half in the water, and its 2 hours long if it is a private lesson, 3 hours long is there are 2 of you. The sessions after that are in the water and are 2 hours long if it is a private lesson, 3 hours long if there are two of you. Its 40 euros for an Introduction to kitesurfing. You need to be at least two. The lesson will be on the beach. You will be flying kites which have the same control bar system than the big kites we use in the water (just not as powerful), so it is the real deal (no two lines trainer kites). 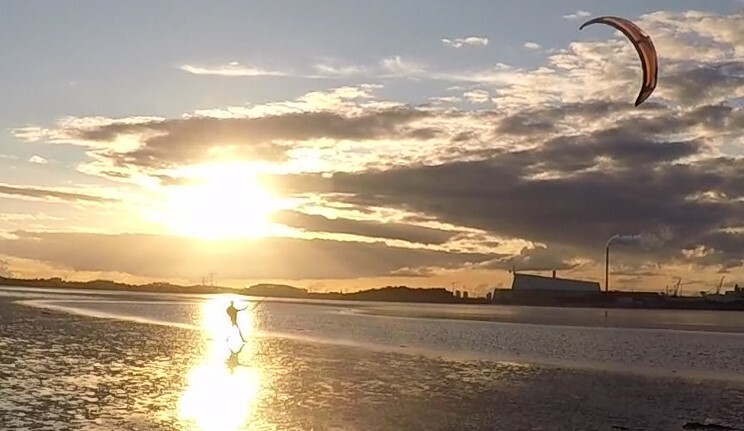 You are not sure kitesurfing is for you, this is the cheapest and most relaxing way to find out. I provide everything for the lesson, wetsuits too. Just make sure you give me you height, weight, feet size for me to plan the lesson and bring all the right gears. 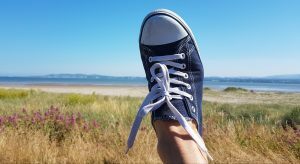 All you need to bring is runners and comfortable warm clothes for the lesson on the beach. A rain jacket is handy as it will protect you from the wind. For the lesson in the water, all you need is your swimming gear to wear under the wetsuit and a towel. Water of course and sun cream. How many lessons do I need before to be able to do it on my own? It usually takes 4 lessons to get the skills to get up on the board, and to know enough about how to make a session safe. I have my own gears, can i learn with them? If they are safe, and the size suit the weather condition, yes, but not for the first lesson. The gears I am using are made for teaching and will make you learn kitesurfing fast. If you manage well, we can use your gears, but the price of the lesson will be the same because, your gears will be probably second hand, I will have to check them, tune them, and probably fix them. The good thing for you is, after the lesson, you will have gears than are safe and are working. 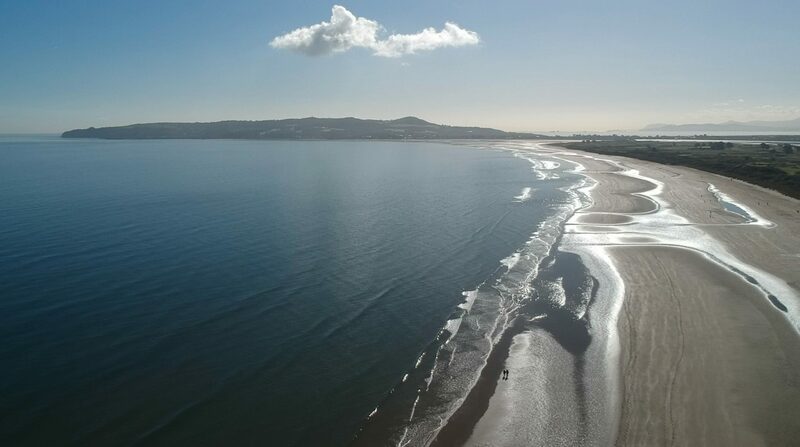 Where do we learn kitesurfing? 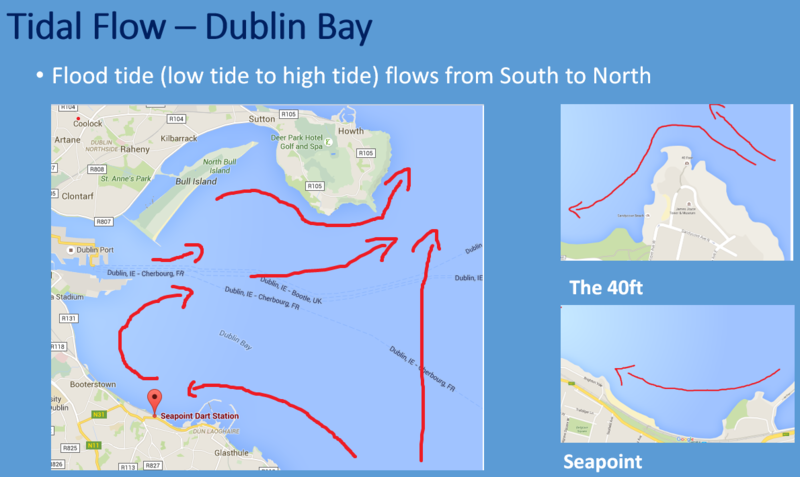 Depend of the wind direction, Portmanock, Dollymount, Poolbeg, Burrow beach Sutton, check Contact Page. Here is a list of what you are going to learn. From the beginning of the kitesurfing lessons to the end, everything in this list is going to be explained and should be understood by you. 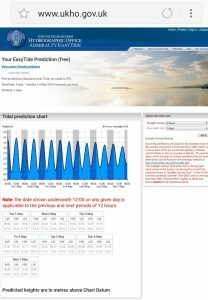 Please come back to this list to check if everything there is clear as it will make you a safe independent kitesurfer. You will have to learn how to prepare a session, how to find the right wind for the right place. 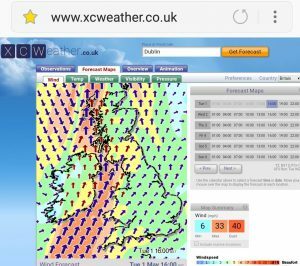 We will be talking about wind direction, wind strength, wind quality and how important it is to be aware of any change of wind and weather condition. 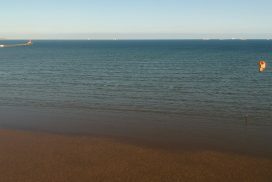 Kitesurfing is done mainly in the sea, and the tides there will change our playground. 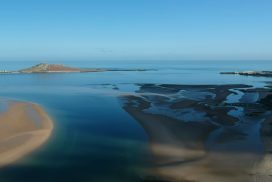 We will learn why tides are so important for kitesurfing. 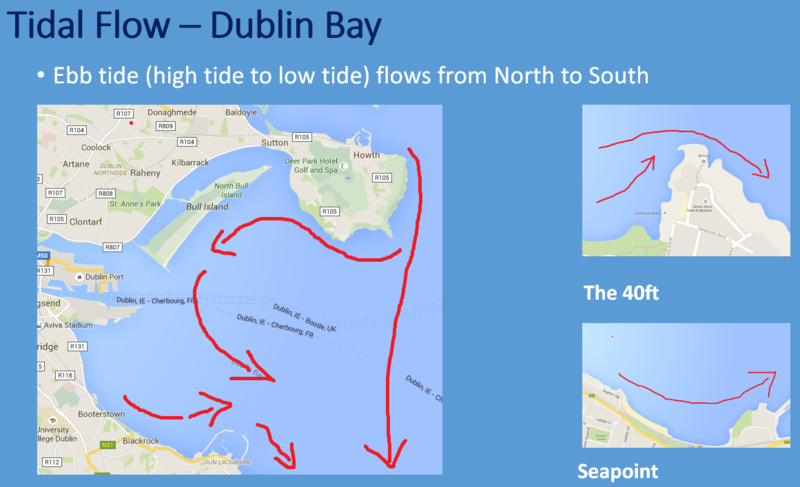 You will learn about neap tide, spring tide, current, rule of 12th, why atmospheric pressure is important with tide. How to do a site assessment: S.H.O.E. S.H.O.E. Surface, Hazard, Others, Environnement is your site assessment. 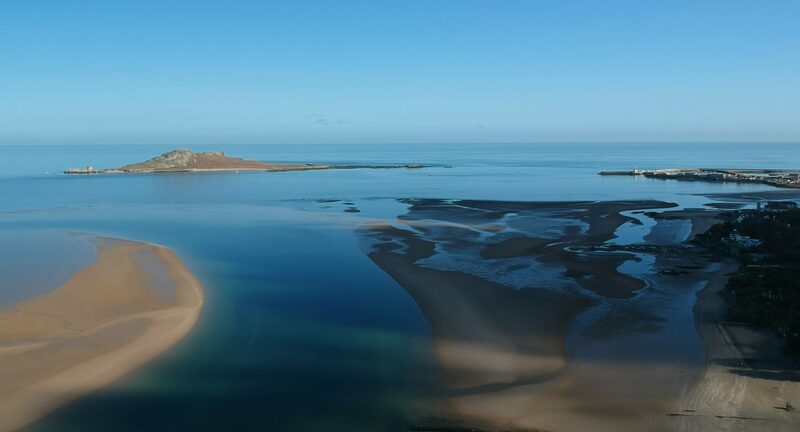 In a site assessment you will check if it is possible to do kitesurfing in a place. You will look for the hazards of a place and can you stay away from them. You will check everything than will make you session easy or not. 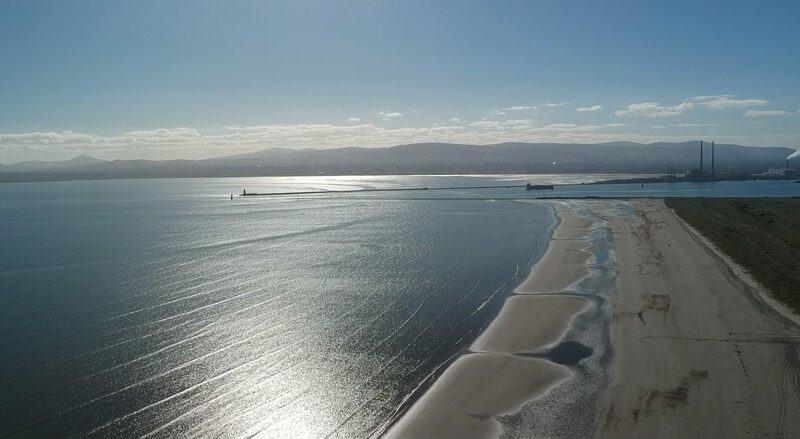 We will be checking the surface, is the surface suitable to do kitesurfing, is the surface large enough to do kitesurfing, surface on the beach, surface in the water. We will be talking about how to spot the hazards of a place and how we can stay away from them. Hazards visible and invisible. We will have a look at the others on the place and what we do to keep them safe at the same time we do our sport. 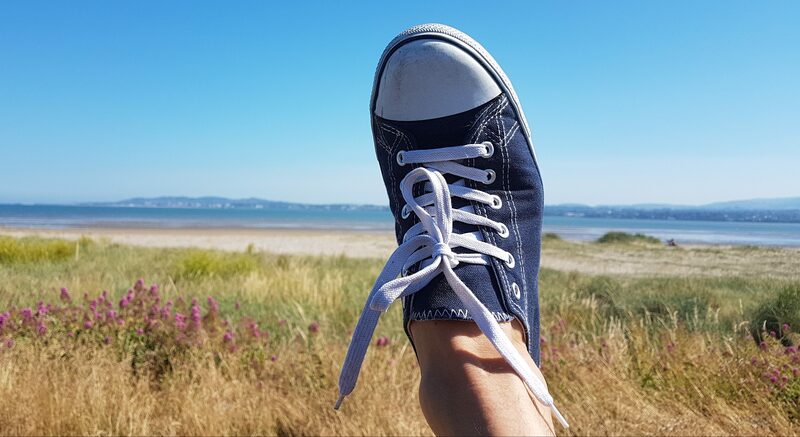 There are quiet a lot to check and to be sure you don’t forget anything when you do a site assessment, use this mnemotechnic trick: When you put your SHOE on the beach, do your site assessment, and S.H.O.E. 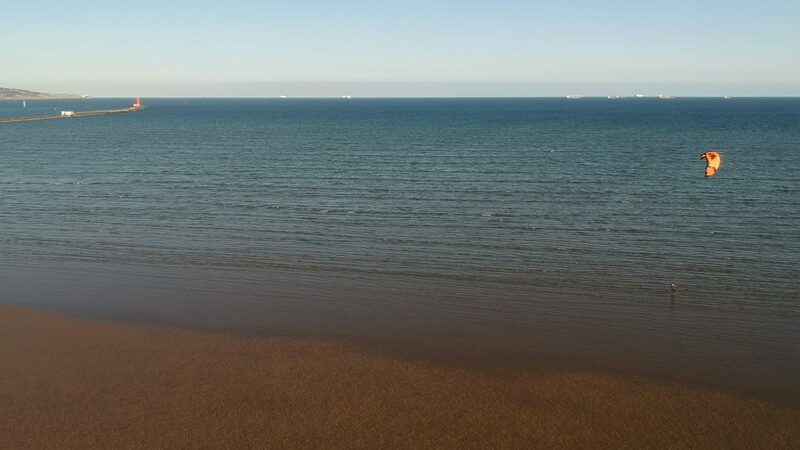 Surface.Hazard.Others.Environment(wind &tide) is your site assessment. How to do the pre-fly checks: S.E.A.T.S. They are the checks you do just before launching your kite. They are a big deal as most accident happen at launching. Your materiel is as strong as the weakest point. If your materiel brake, at the best, everything stop, at the worst, your kite keep flying without any way to control it, you keep getting pull by it until you activate the safety. I will show you how to check your materiel and specially where you can find this weakest points. That will be the time to check your safety system too. You will do this check at the end of your session too because, if there is something to fix, you want that to be done before your next session. You have already chosen the size of your kite when you did your site assessment, but as you are getting ready, the wind can change. You need to keep an eye on the wind until the last second of launching your kite because if the wind is too much for the kite, it won’t be easy to control, and you don’t want that on hard ground. Sometimes it just means you have to wait for the wind to come back to normal (a black cloud is passing by for example). Setting up a kite is quite easy, but it is easy to do a mistake too. I will tell you what mistake can be done and what could happen. Tuning a kite is very important as a kite than is not tune won’t fly well. I will show you how to do it. We will talk too about because lines shrink, they can untune your kite. (yes lines shrink, back lines more than front lines because there is less tension on back lines). The 360 degree check, the wind check again, the leash connected to the safety line but the chicken loop connected to you at the last second when everything look right. How you communicate with your launch helper. And most important, how you have your primary safety in your mind, if anything start to go wrong, you activate your safety without hesitation. Your kite is a wing and you are the pilot. Like the pilot of a plane, when they are taking their SEATS, before taking off, they are doing the pre-fly checks and so are you: S.E.A.T.S. 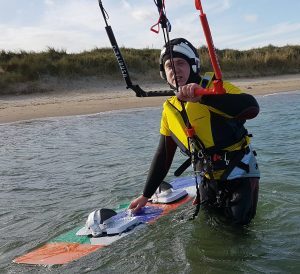 First safety, let go the bar: what does it do, why it is not enough outside of the water, why does kitesurfer find it hard to use it? Second safety, Primary safety: how does it work? what does it do? what could go wrong with it? Third safety, leash quick release: why would you think twice before to use it? How does work the control bar system, the angle of the kite, the steering of the kite. the 2 forces the wind create on the kite, lift and drag. The angle of attack. The right use of the control bar system to give the kite the right angle of attack, the sweet spot. The true wind, the wind created by the kite flying, the wind the kite is feeling. The mistakes you can do piloting the kite, how to spot them straight away, how to correct them. 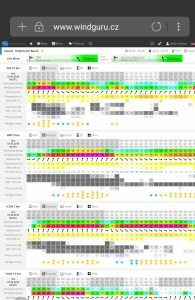 Why a gusty wind will make fly a kite a lot more difficult? What the trimming system there for? It is the area in the sky where the kite is flying, and it is the area on the ground where the kite can crash. there are 3 areas in it, neutral zone, power zone, intermediate zone. You will get used to visualize mentally you wind window, you are the center of it, the size of it depend of your lines length, the position of it depend of the direction of the wind you are feeling. You will get used of using a clock to give the position of your kite. -Control the power of the kite. -Launching, relaunching, landing the kite. -Safety of others and yourself. Never a nice feeling to be in deep water with your kite stuck in the water. You will learn to do the right thing to get back your kite in the air even with light wind. How to do a Deep Water Self Rescue Safety Pack Down. You are in deep water, the kite stuck in the water because the wind stop or something wrong with the materiel. You will learn how to rescue yourself using your kite as a raft. 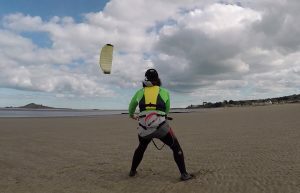 Kitesurfing kites are too powerful to just fly them standing up. You can walk with them. If the kite is in the neutral zone of the wind window, you won’t get to much pull from them, but when you want to learn to fly them, the best way is to get into the water and to let them pulling you in the water. Its safer and its more fun. There are different body dragging, all of them have a reason. You just fly the kite in front of you, right and left, keeping the kite away from the water. It is the easiest one, you learn than if you fly the kite, you get pull by it, you stop flying the kite, the kite stop pulling.You learn too than more you put pressure on the bar, more you fly the kite close to the power zone, more you get pull from the kite. Less pressure you put on the bar, more you fly the kite close to the neutral zone, less pull you get from the kite. In kitesurfing, we don’t just go downwind, or we go on the right, or we go on the left. You will learn to fly the kite only on one side of the wind window, on the right side to go on the right, on the left side, to go on the left. As you fly the kite closer to the water, you will have to be more sensible with the bar. Closer the kite is from the water (or the ground) more the weight of the kite will try to bring it down. You will have to learn to not pull the bar as it will be your reflex at the beginning. Pulling the bar will only stall the kite (kill the lift). You will learn to put the bar at the right place (sweet spot) to give your kite the right angle for it to fly well. when you kitesurf and you loose your board in deep water, you have to body drag to it to get it back. As it will be behind you, upwind, you will have to learn the right technique to do it. We will talk about why we don’t use a board leash, what do we do if body dragging is not enough. Not in ireland but in some place abroad, you will have to body drag with your board to get to the place where you can kitesurf. You will need to get a stroke of power from your kite by flying it closer to the power zone to get up on your board. You will learn to master that doing body dragging. The point is to get enough pull from your kite to pull you out of the water but not too much. A way to get more pull from the kite is to fly it faster. you will have to learn to be aggressive with your kite and stay in control. Description: you will learn about, pads, fins, concave, rocker, outline, channels, tips, width, flex (check this blog about boards Click here (then come back)). How to set up your board. Why the board keep you over the water when its moving but sink when you stop moving, lift and drag. What do you use the board for(direction and speed, edging, angle of attack(with the water). Walking with your board: you will have to be able to fly your kite with one hand. Learn to put your board on your feet: you will have to learn to keep you kite steady in the neutral zone when you put your board on your feet, and then learn to stay steady in the water without spinning. 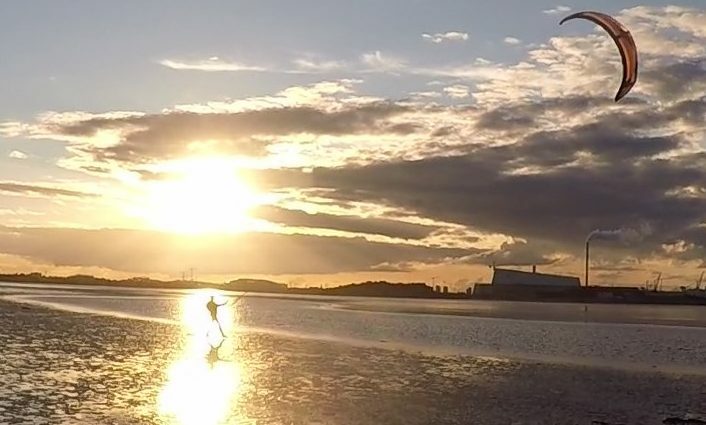 The technique: What you do with the kite, what you do with the board, what you do with your body. When you have to use the kite and the board at the same time, its a lot going on, I will give you the main point you have to focus on, to keep it simple in your mind, and do the right thing at the right time. You can compare the waterstart at how kids learn to ride a bicycle. When you get it, you get it for life, and the feeling is quite overwhelming. After your kitesurfing lessons, if you have any questions, don’t hesitate to come back to me. Kitesurfing is a lot about tips, and I have a lot of them! Is kiteboarding and kitesurfing the same? you can use a snowboard or skis and a kite on the snow, its called snowkiting. You can use a mountain board (board with big wheels) and a kite on the beach or on the grass in a park, its called Mountainboard kiting. You can even use a buggy and a kite, its called Kitebuggying. 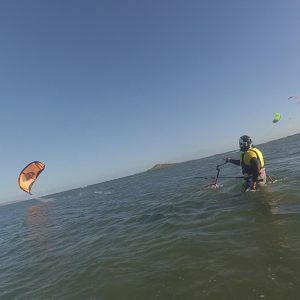 In the water, you will start with a twin tip, small rectangular board (around 140×40) (not a wake board, they won’t work for us), and that’s what is called kitesurfing (american won’t use this word much, but will use the word kiteboarding for kitesurfing, just let you know). Then you can use a directional board, if you want to surf the waves, its a board than look like a surfboard but its made for kitesurfing (real surf board won’t work as well for us), and that would be called, wave riding. You can even use a hydrofoil now on your board and that’s is hydrofoiling or foiling. 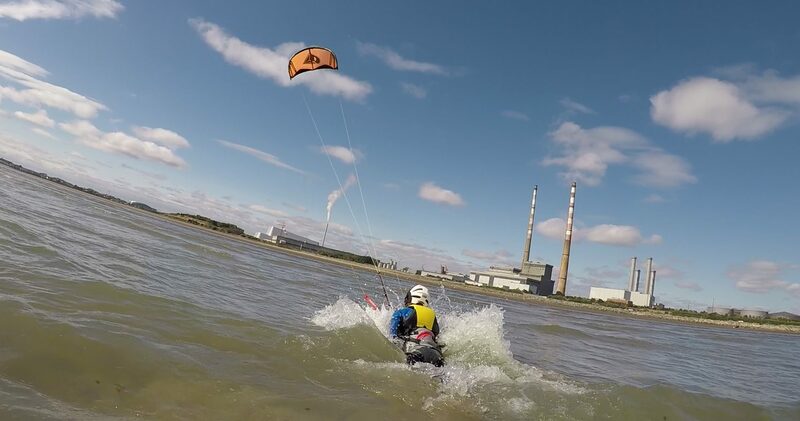 So there are a lot of sport you can do with a kite but its easier and safer to start with kitesurfing. 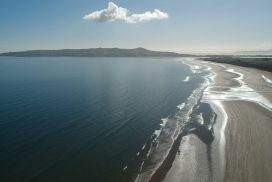 I am a bit afraid of water, can I learn first outside of the water, on a mountainboard for example? Power Kites are very powerful toys, (more weapons than toys really), the best and safest way to learn them is to do it in shallow water. First because if you loose control, and you loose balance in the water, there is very little chance to get hurt. Second, when you loose control, most of the time the kite crash. And when a kite crash in the water, it doesn’t relaunch that easy and everything stop so you are safe. I got very lucky, I got kitesurfing gears for very cheap, can I learn with them? If you know nothing about kitesurfing, there is a big chance you got useless gears and just wasted money! Kitesurfing is a young sport, and gears started to be available to buy beginning of years 2000. At the beginning, it was a lot of experiencing, people where just trying to make it work, and safety was not that great. Some people not very nice are still trying to get rid of these kites from the beginning and make money. There are two types of kite we are using for kitesurfing. Foil kites with closed cells (look like a parachute a little bit,(they are not,i just make it very simple) with a lot of tissue and a lot of bridles, all connected to a mixer or speed system (a system of pulleys connecting the bridles to the four lines control bar system) and inflatable kites (they have inflatable leading edge and struts, you need a pump for them). Foil kites with closed cells are not for beginners so you can forget about them for the moment. Why?, they are very sensitive to piloting mistakes. You will probably destroy them before you will enjoy them! 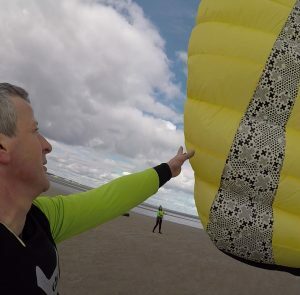 Inflatable kites are the kites you will learn kitesurfing with. There is no point to buy inflatable kites older than 2008/2009, too many are not that great and not that safe. After that, no point to get a C kite type, they are not for beginners. Then what you do is checking reviews about the kite you are interested with from normal people than leave comment on forums. It is the only way to have a honest review of the kite. Be careful, you need to know the year of the kite. A kite can have the same name but every year, stuff are being change, to try to make it better but sometime, they make it worst. The best way to know the year, is with the design and color of the kite. And that’s not enough, if the kite have been well used, it will be stretch, tired, not as good than it was as the beginning. Really you should try it before you buy it, or ask the seller to try it in front of you. Don’t hesitate to ask me. I have some powerkites at home, foil kites, some with handles, some with a bar, not sure what they are good for, can i use them to train a bit at home? 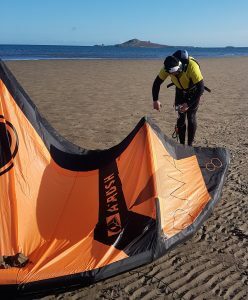 The common point between this kites and the kites we are using for kitesurfing is they have all a profile to fly, they are foils, they have a profile of a wing like a wing of a plane or a wing of a bird. We call them kite in english but in french,we call them aile (wing) because that’s what they are compare to cerf-volant (kite in french) than are kites or stunt kites used by kids or big kids usually on the beach, and having a lot more flat profile giving a lot less pull from the kite. Now the big difference between this kites and the kitesurfing kites is we can change the angle of incidence of the kitesurfing kites. The point is to give to the kite the right angle between the kite and the wind the kite is feeling to make it fly well, with the right amount of lift and drag. The powerkites you probably have at home have a bridle system with a fix angle of incidence, even if they are four lines. The 2 lines at the back would be there just to create more drag on the kite, to make it turn quicker, but not to reduce or increase the amount of lift. It means than with this kites, if the wind get stronger (gust or weather change) or if you make a mistake piloting the kite, and you get too much pull from it, you will have no way to depower the kite, meaning you can crash hard and hurt yourself! The best way is to bring them to me at your fist lesson, i can check them and tell you what they are good for, and check the safety on them.